Flat roofs vary according to factors like slope and functionality. Flat roofs are not completely flat but they have a very subtle slope of less than 5°. Some of them are designed for higher traffic, others for lower traffic, so they can have slightly different structures. There are several types of materials used for flat roofs and they must provide good sealing and protection against water infiltrations. Traditionally, flat roofs used to be covered with a mixture of concrete and gravel. However, this option is not very durable because this type of asphalt becomes fragile over time and surface cracks will appear eventually. In addition to not providing long-term protection against moisture, this material is not considered sustainable, because during production and installation, there are chemicals released into the atmosphere. For new constructions, there are now new types of flat roof materials, such as composite polymer-based liquids. 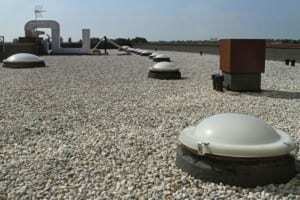 They are much more efficient and create a membrane that practically seals the roof. According to Fort Collins commercial roofing flat roof experts, being a relatively easy and low-cost option, any type of flat roof offers protection as well as multiple possibilities for using its space, which makes it a good choice, especially when it comes to modern, minimalist, cubist style or commercial buildings.